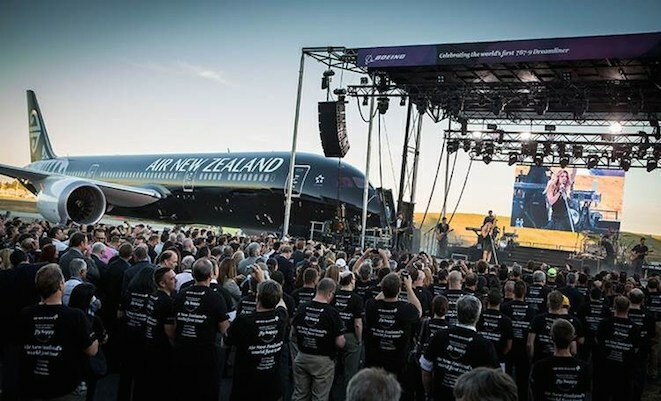 Boeing and Air New Zealand have marked the delivery of the airline’s first 787-9 in a special event on Tuesday evening attended by Air New Zealand staff and guests and more than 1,000 Boeing workers. Air New Zealand is the launch customer for the stretched variant of the Dreamliner, with 10, powered by Rolls-Royce’s Trent 1000, on order. The first aircraft, ZK-NZE, was contractually delivered to the airline in late June, with the milestone marked by the event at Paine Field’s Future of Flight Museum (adjacent to Boeing’s Everett widebody production facilities) ahead of the aircraft departing on its delivery flight to Auckland on Thursday. “This delivery is hugely exciting for our airline. 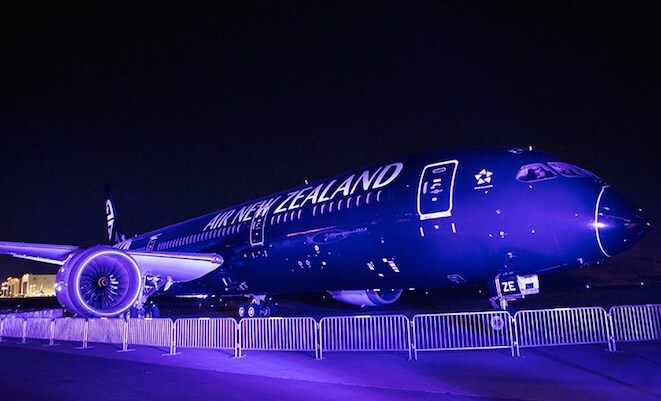 We truly believe this aircraft will be a game-changer for our business,” Air New Zealand chief financial officer Rob McDonald said during the delivery ceremony. ZK-NZE is expected to arrive in Auckland on late Friday afternoon. The airline is then due to place the aircraft into service between Auckland and Perth from mid-October and to Shanghai and Tokyo by the end of the year. Air New Zealand’s 10 787-9s on order (plus eight options) will allow it to replace its current 767-300ER fleet. “The Dreamliners in our launch configuration will be 20 per cent more fuel efficient per seat than the 767s they will replace, as well as being able to carry 10 more tonnes of cargo on our long-haul flights,” said McDonald. Air New Zealand is configuring its 787-9s with 302 seats (including 18 Business Premier and 21 premium economy seats). To date, 26 customers have ordered 409 787-9s, accounting for 40 per cent of all 787 orders. 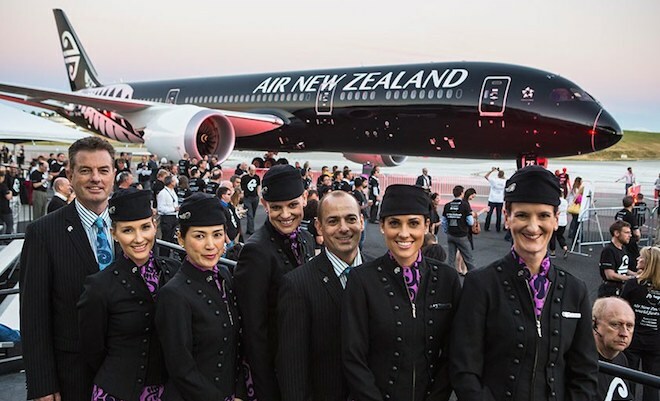 Air New Zealand cabin crew with the 787-9. American country music group The Band Perry performs at the 787-9 delivery ceremony. Congrats ANZ…showing all how it’s done! The right aircraft mix…777, 787, A320…and a can do management team! And most importantly an airline it’s employees and all New Zealanders can be proud of. I’d choose ANZ any day! Take note QF and VA! Top marks Air NZ. Another great choice. Wait for the 777X order now! More delighted customers! Truly a great airline – a pleasure to fly with ! Reverend. Why do air nz need to replace the 772? Congratulations Air New Zealand but sorry the colour is terrible a silver fern is not coarse like that it is delicate and black is dirty colour, does not wear well. Where are the Teal and Pacific blues we are well known for. Not everything revolves around the All Blacks so why pander to them?